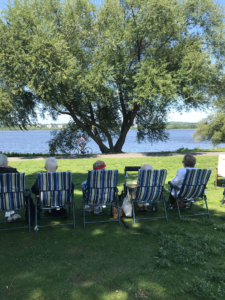 After four months of picnicking all around the Ottawa Valley, and Lanark County, Waterside Retirement Community hosted their last picnic of the season in mid-September. This past summer has been our best picnic season yet, thanks to many sunny days and warm temperatures. Now, only memories of picnics at the Newboro Locks, Remic Rapids, scenic countryside tours, and delicious peanut butter and jam sandwiches will suffice until picnic season starts again next May. Throughout the cooler months, we will travel to local restaurants to enjoy what local chefs have to offer. Community Members will have the opportunity to share their views and experiences through the Waterside Wave.